Last Sunday's Golden Globes did not only kick off the award season 2017 but also a season filled with breathtaking fashion. - as well as yellow ones. Overall, I think the fashion was a great opening for what's to come this award season. 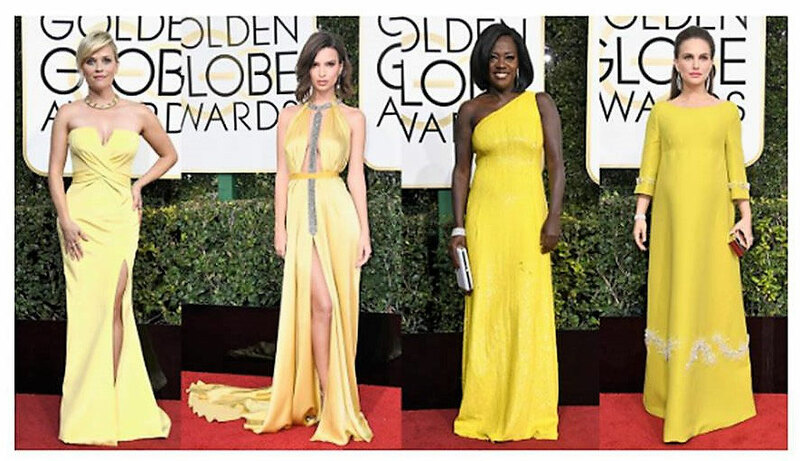 Here are my top three looks of the Golden Globes 2017. Emma Stone did not only win Best Actress in a Comedy/ Musical. For me, she also wore one of the best dresses of the evening. A Valentino Haute Couture tulle dress embroidered with stars which faded out towards the bottom. I love, how the lightness of the dress complimented her snow white skin tone. The necklace, however, was too heavy for the look, I would have skipped it. Also Freida Pinto went with a gown that combined two trends of the evening, tulle and sequins, she managed to stick out of the crowd because the cutouts at her waist and the sheer bottom part put an edgy twist on her gown. Olivia Culpo wore my absolute favorite dress of the evening because she chose something no one else did - an allover flower print dress. The floral pattern of this Zuhair Murad dress is one of a kind. I am stunned how such a dominant print can look so vibrant instead of dated like so many other ones. The full skirt was brilliantly balanced out by a more skin showing top part, therefore, avoiding that the print appeared overwhelming. Her hair and makeup were also impeccable. Making her my number one look of the evening.